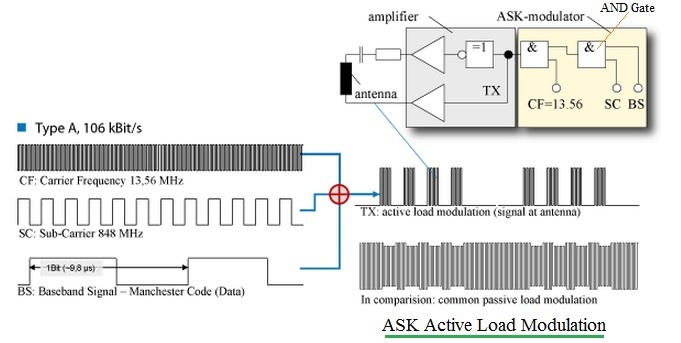 This page covers ASK Active Load Modulation used in NFC. It mentions frequency spectrum of active load modulation. The load modulation is used in NFC (Near Field Communication technology) in tag or transponder part. As shown in the figure-1, the transponder consists of ASk modulator IC (housing logical AND gates), amplifier and antenna. It consists of capacitor and resistor in parallel to the antenna. The input to the ASK modulator are Carrier Frequency(CF) of 13.56 MHz, Subcarrier frequency (SC) of 848 KHz and baseband manchester coded signal. These are passed through AND gates as shown in the figure-1. It produces DSB (Double Side Band) signal as shown in figure-2. The amplitude is amplified using amplifier in the circuit. This signal is passed through the R/C combination parallel to the antenna coil. When resistor is brought into the circuit then, current is increased through the antenna while when capacitor is brought into the circuit then it changes the resonant frequency of antenna circuit. Due to this, load on antenna changes which results in weak signal which need to be detected by PCD demodulator. Hence it is known as load modulation. Above figure-2 depicts RF frequency spectrum seen at reader. 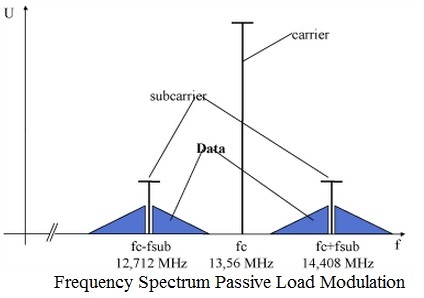 As shown passive load modulation consists of RF carrier, two sidebands (at 12.712 MHz and 14.408 MHz) and modulated sidebands on these two subcarrier signals. All the transmitted data is carried in the two sidebands. Due to this fact, RF carrier of 13.56 MHz need not have to be transmitted by the transponder.